On October 1st, 2015, communications with the massive Mærsk corporation cargo ship, the El Faro, were lost after captain Michael Davidson radioed in to report that the ship had lost engine propulsion, was taking on water, and listing a “manageable” 15 degrees to the side. According to the Washington Post, one crew member, Danielle Randolph, also expressed concern in an email written to her mother earlier that day - “Not sure if you’ve been following the weather at all, but there is a hurricane out here and we are heading straight into it.” Unfortunately, her concerns were completely justified, but expressed too late. 30 days later, search crews identified the vessel approximately 15,000 ft, about 3 miles, underwater. The entire cargo of 391 shipping containers, 294 cars & trailers, and crew of 33 were lost to the sea, making it the worst disaster involving an American cargo vessel in decades. The 790-foot El Faro had been in active operation since 1975 without incident, yet the unforgiving force of Hurricane Joaquin was strong enough to send the reliable vessel to a watery grave. How could this happen to such a large and qualified vessel? Despite their imposing construction, even the largest cargo ships are not immune to the power of nature, but there are ways that these kinds of disasters can be avoided, even in the heaviest weather. Modern cargo vessels are designed and built to withstand the strongest storms around, but no crew wants to find themselves in the midst of a hurricane. 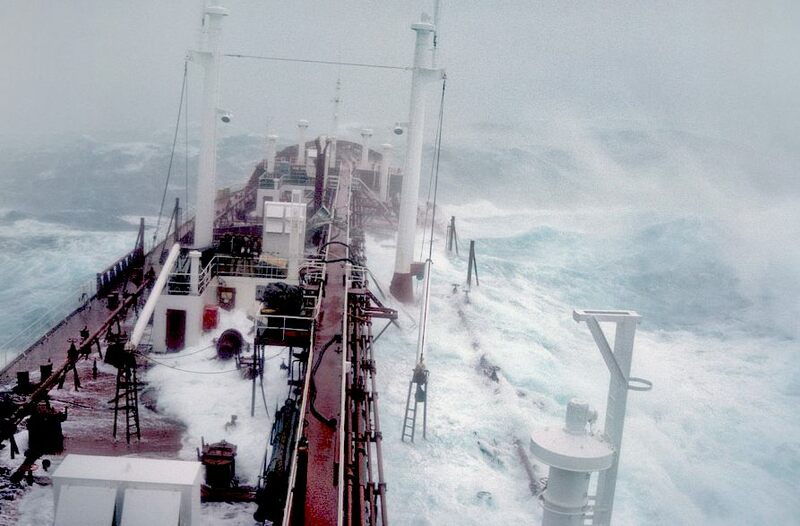 Being caught in a storm at sea can be a terrifying experience even for the most seasoned seafarer. However, the walls of water and powerful winds that arise during a severe ocean storm are an unavoidable aspect of life at sea, and with massive cargo ships, the tight schedule on which they run doesn’t allow them to take time off. A day’s worth of fuel for a cargo ship alone can cost tens of thousands of dollars, so deviating from a schedule can be a massive financial liability. While the weight and size of cargo ships helps to stabilize them, there is truly no actual “safe harbor” during a hurricane. That said, the best place for a large vessel to be during a storm is actually out at sea. Despite being constructed from the strongest materials, the massive waves of intense storms can push large vessels into the concrete pilings of a dock, causing damage to the vessel’s hull. Even worse, if a large ship were to break loose from its moorings during a storm, it would become a massive, floating wrecking ball causing untold destruction. Most of us would consider large cargo ships to be slow moving, with top speeds of most ranging between 15 and 30 miles per hour. At that rate, their only hope of avoiding an active hurricane on their journey is to depart early enough to safely cross the path of the storm. For this reason, most cargo ship captains follow the “1-2-3 Rule”, referring to the first, second, and third day of a hurricane’s forecast. Following the predicted weather forecast would ideally allow a traveling cargo vessel to stay at least 100 nautical miles from a hurricane’s path. However, this method is not 100% effective - hurricanes and other powerful storms can change direction at any moment, catching an unsuspecting vessel in its destructive path. And the later you leave, the fewer options you’ll have. In these situations, as was the case with the El Faro, there are still ways to avoid the storm. Slowing down to assess the weather and possibly let it pass, changing course to circumvent the storm, or simply returning to port are all viable options that may have saved the El Faro and other lost vessels from sinking. However, the El Faro’s 35-foot tall mast that held the data recorder, or black box, was nowhere to be found. These devices chart and record the vessel’s speed and position at any given time, as well as critical, decision-making audio conversations between the captain and crew. We may never know what course of action those aboard the El Faro decided to take, but we can still learn from similar situations and keep ourselves and our businesses secure during a storm.